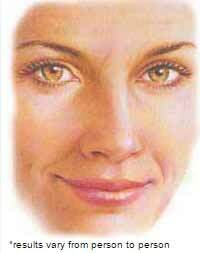 Loose or sagging skin that creates folds or hides the natural contour of the upper eyelid. Excess skin that hangs down form the upper eyelid, sometimes impairing vision. Excess fatty deposits that appear as puffiness in the upper eyelids. Droopiness of the lower eyelids, showing white below the iris . Excess skin and fine wrinkles of the lower lid. These conditions typically appear as part of the natural aging process, or due to heredity. Where they are the result of heredity, individuals as young as their 20’s and 30’s may achieve a marked improvement in the appearance of their eyes through eyelid surgery. Eyelid surgery removes excess skin, eliminates bags and restores firmness to the area surrounding the eye, making you look more rested and alert. Healthy individuals who do not have a life threatening illness or medical conditions that can impair healing. Individuals with a positive outlook and specific goals in mind for improvement through eyelid surgery. Eye disease such as glaucoma, dry eye or detached retina. Thyroid disorders such as Graves’ disease and under or over-active thyroid.